COLUMBUS, Ohio (February 25, 2019) – Cameron Mitchell Restaurants (CMR) is pleased to announce the newest restaurant concepts to join the company’s impressive portfolio of award-winning restaurants in 2019 – Del Mar SoCal Kitchen and Lincoln Social Rooftop. Del Mar and Lincoln Social, located at 705 and 711 N. High St. respectively, are expected to open in April 2019 in the Lincoln building located in the Short North Arts District. The management team includes Executive Chef Sonny Pache, a CMR veteran who recently transferred from Ocean Prime Dallas, and General Manager Laurie Kniess, who is the current general manager at The Pearl. A hiring office, located at 692 N. High St., Suite 202, opens today to recruit talented individuals who are committed to providing genuine “Raving Fan” hospitality for guests. CMR will add 100 new jobs between the two concepts and is seeking servers, guest service associates, bartenders and kitchen staff. Interested applicants may apply online or by visiting the hiring office in-person between 10 a.m. – 6 p.m. Monday-Friday or Saturday 10 a.m. – 4 p.m. For hiring questions, please call (614) 300-9500. While still in development, Del Mar will be a full-service restaurant, offering the best of California-inspired dishes and cocktails. The restaurant pays homage to a SoCal Kitchen with “good food, good vibes and good times to remember.” The talented culinary team is fanatical about freshness and uses only the best fare from the farm, garden and sea. The dinner-only restaurant also will have a heavy focus on vegetarian and gluten free options. 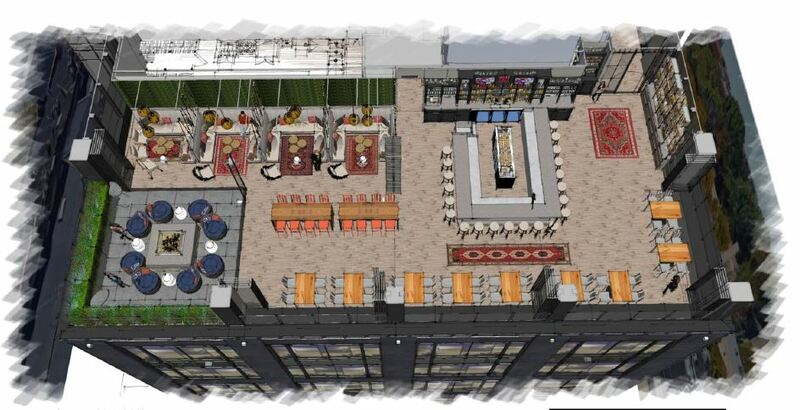 The urban rooftop lounge, located atop the Lincoln building, is the perfect way to enjoy the Columbus skyline and will open just in time for patio season. With a retractable roof and a fire pit, this cool rooftop oasis is the ideal spot for guests to sip, savor and surround themselves within the cityscape. Enjoy the sweeping city views with a cocktail in hand, crafted by CMR’s expert mixologists and stay for a flavorful bite created by the award-winning culinary team. This will be an energetic gathering place complete with an ivy wall to grab the perfect Instagram picture. An elevator in the Lincoln building will transport guests between the restaurants, so two distinct experiences may be enjoyed in one evening.